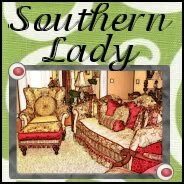 Those of us who have been blogging for awhile remember Nancy from Southern Lady blog. Nancy was a very active blogger for several years but now she's a busy working girl! I begged her to send us some pictures of her new house and here they are!! You can see the southern style from the moment you drive up. Now I won't talk too much....just enjoy. Nancy and her husband stumbled on this beautiful painting one day. She said it reminded her of herself at that age so much! It was painted in 1980 and she was about the same age. Her sweet husband gave her the painting for her birthday. I'm green with envy over all of that molding! Nancy said she has found a consignment shop she loves. She takes items in and brings things home. Looks like a show home to me. this one was taken in the morning light. Look at the way the light glows. I have more pictures to share in a day or two. Wait till you see her dining room!! UPDATE 9/7/18 See Nancy's new home here. Love it Stacey! So glad you talked her into sharing! Can't wait to see more! 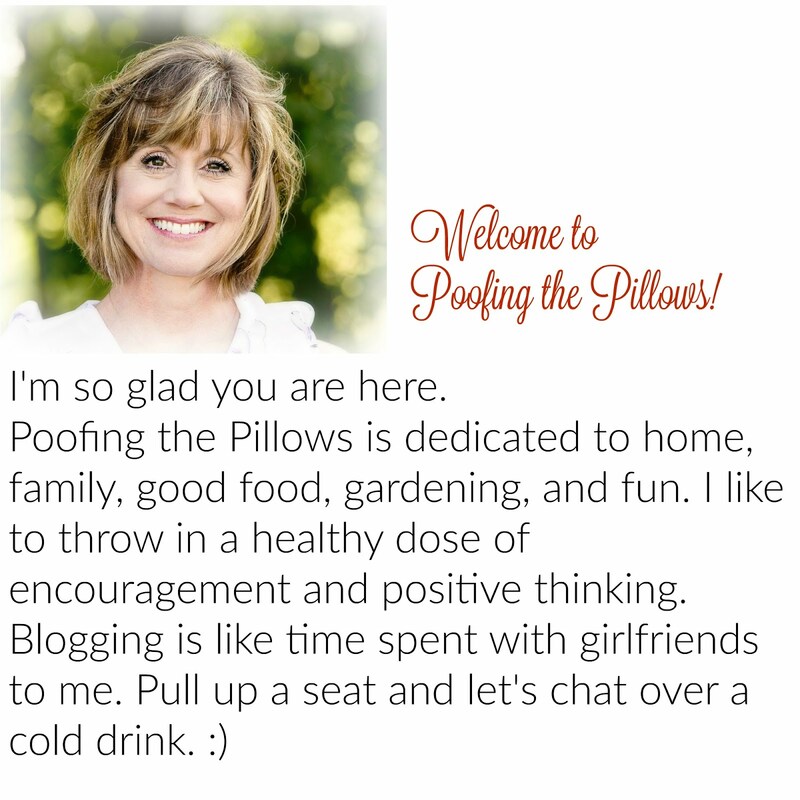 Talk her into blogging again...PLEASE! Loving your new home too! What a beautiful home she has! 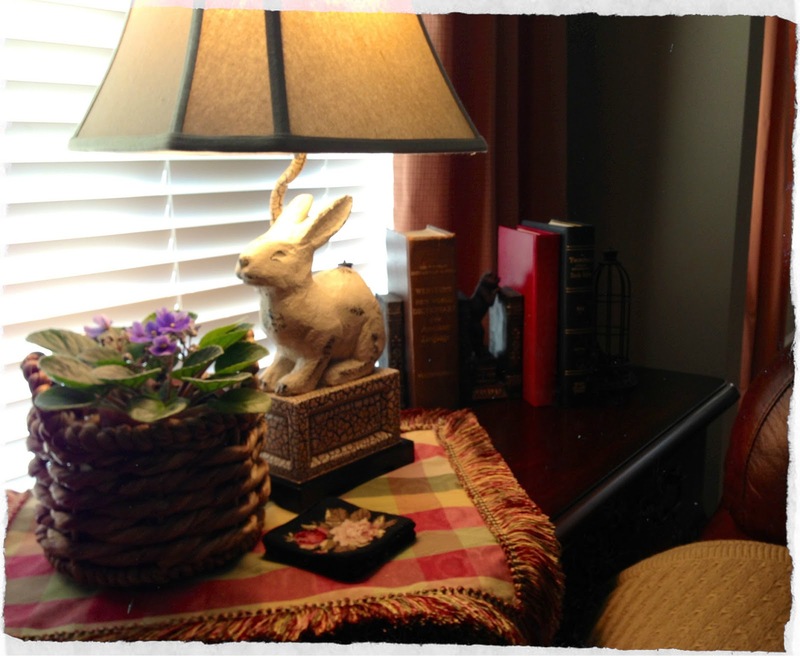 I always enjoy getting to peek into other homes and see what new ideas I can come away with. I really like how she has the couch in her living room at a slight angle. It never would have occurred to me to do that, yet it works in the space. I'm going to have to look at some of the rooms in my house with a new eye and see if I can get away with that. I think it would give the room a whole new look. Thanks for sharing her with us. I look forward to seeing her dining room! Very pretty home! When I lived in Texas, I had a consignment shop right down the road I just loved. I love her house!! 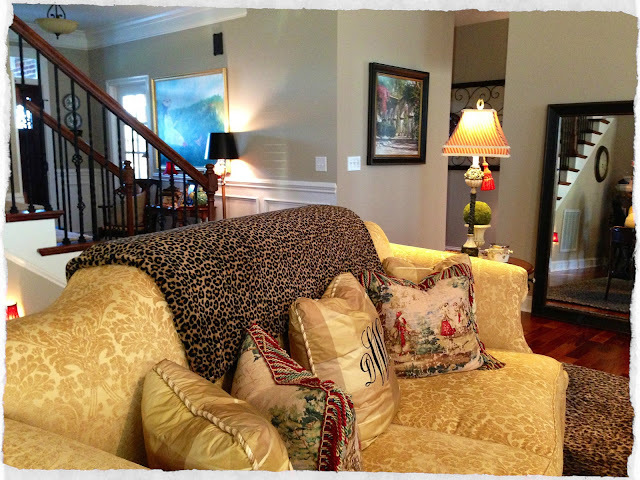 I love it all...the leopard throw on the couch, the bunny lamp, the tassles, the painting, right down to the dog in the front yard! Lovely, lovely home. Can't wait to see more! What a striking home. She needs to be on a home tour! Pretty! I can't wait to see the rest of it! What a beautiful home. It's elegant but looks comfortable, too. That's sometimes hard to combine! Love the big mirror against the wall. I may want to use that idea! I have always loved Nancy's style. I miss her blog. Thank you and Nancy for sharing her lovely home. Hi Stacey! Oh, how I miss Nancy! 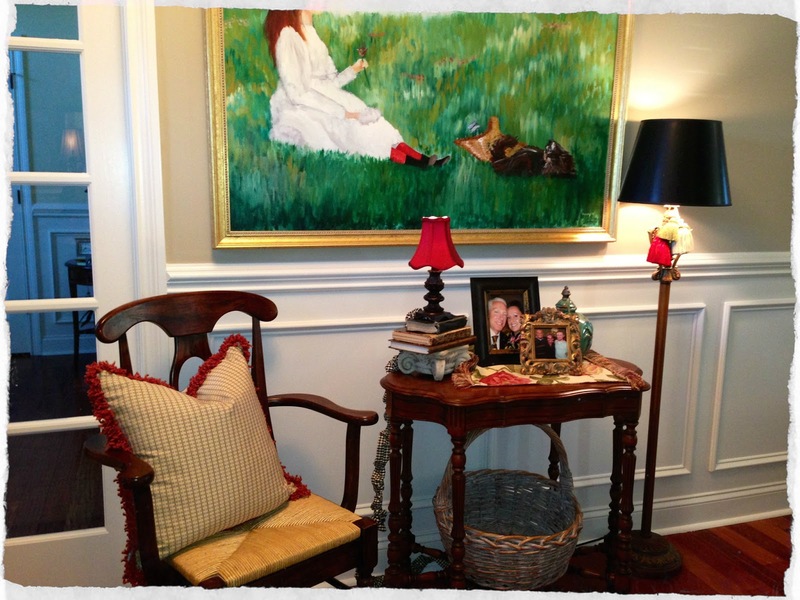 I have always loved her decorating style and miss her blogging so much. Maybe we can talk her back! Thanks so much for featuring her new home - it's gorgeous. 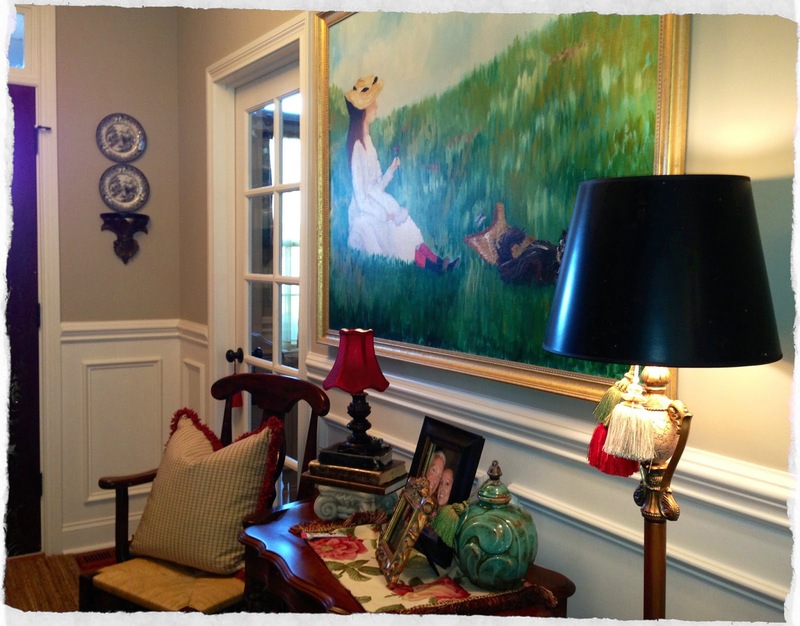 Her home is beautiful...and yes, I love the beautiful mouldings too!! Oh my Miss Stacey, I love this post ;) I was so excited, when you offered to do an update on me, I couldn't hardly contain myself! I am so happy that you and I have continued to stay in touch, since I left blogville. Your friendship means so much to me!! And although we have never had the opportunity to met, I hope that someday our paths will cross!! I want to thank everyone for the sweet comments! I do remember so many of these bloggers! I miss y'all so much. Believe me when I say, Stacey never gives up on my return to blogland, she gets after me sometimes to do a post, and I appreciate that! 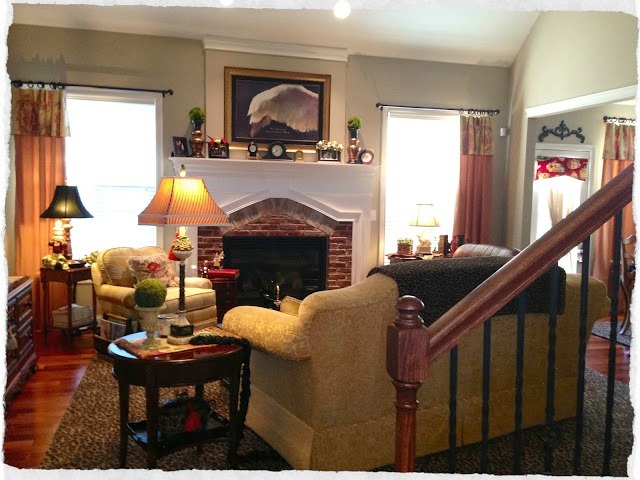 Stacey, Thank you so much for your kindness and for sharing my home on your blog! And until our paths meet, we will continue to grow our friendship wherever we are each planted. Pretty and I love the large girl painting. I can see why she wanted it. Nancy has a beautiful home. That painting is gorgeous. So sweet that you both remained in touch after she stopped blogging. are staying in touch with each other. 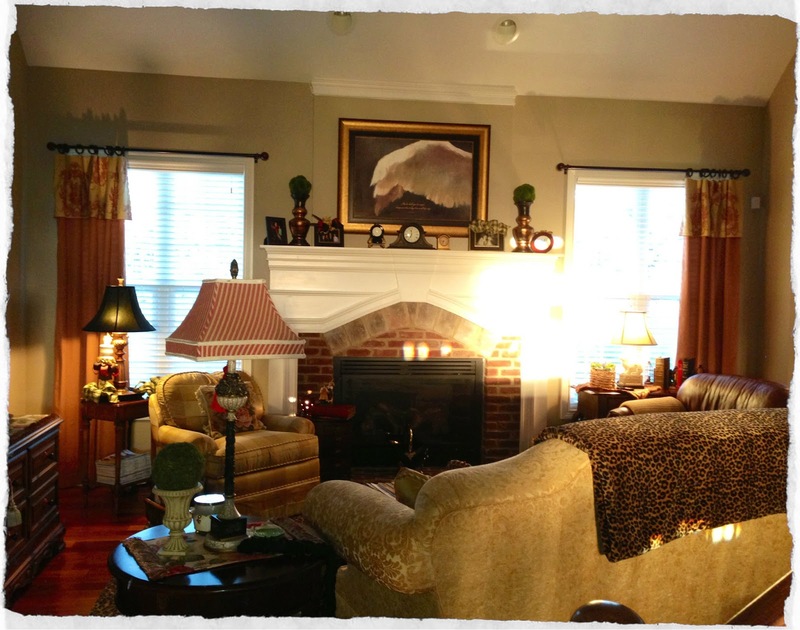 Nancy's home looks so warm, inviting, and comfortable while beautifully decorated. Her bunny lamp adds just the right touch of whimsy, and the large birthday gift painting is perfect in the entryway. I love the tassel you have from her. Thanks for stopping by and leaving a nice comment. Yes, I agree we have common interests. :) I am now following on GCF. My goodness what a beautiful home! So glad you invited me by for a visit! Wish I had the design talent of Nancy! 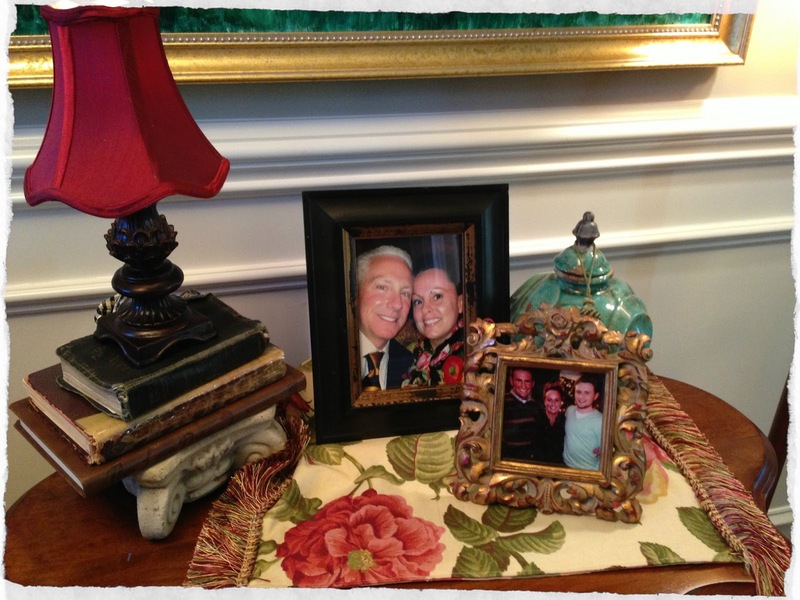 I love her mantel and the layers of coziness she has created in her home. Yes, her moldings are beautiful. Nancy's home is so warm and charming. It has an elegant feel but a comfortable one also. Her personality probably is the same. I am glad she was persuaded to share her home and look forward to more to come. It's so good to hear from Nancy! Glad to know she is doing well and enjoying her new home! It's so lovely and looks just like I'd imagined it would...beautiful! Just beautiful!! Thanks for sharing! Love the molding too! Oh I miss Nancy. You were so wonderful to ask her to share some pictures. Love her style and miss her terribly. I do believe I remember her blog!! Her home is very pretty. Thanks so much for sharing it. i really like her house, Stacey. I don't think I ever rad her blog, but if she loved red, I would have loved it! What a beautiful home! I love the way she decorates. Gorgeous! 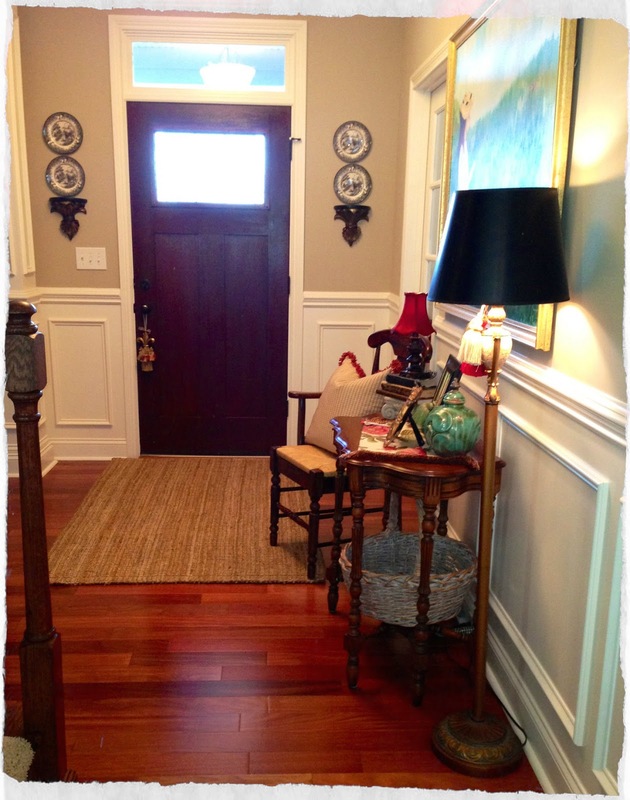 Oh, that wainscoting is wonderful. And, that painting is absolutely beautiful. Pretty painting. I just srarted consigning instead of donating and giving away everything. I've missed Nancy terribly since she stopped blogging. Her Southern style has always been an inspiration to me. Thanks for re-connecting us with this lovely lady Stacey! Such a lovely home! I too am envious of that gorgeous molding :) Have fun with your friends this weekend! Wow, so gorgeous! Miss Nancy always has the most amazing taste and style choices. I would love to see her blog again one day. What a gorgeous home. Thanks for sharing. No wonder you were excited to share her house, it is so beautiful! I like the lighting and the colors of the décor. It looks most inviting! I too love that molding! Oh my it is lovely! What a gorgeous home! It reminds me of my home in so many ways except her home has so many more features! I'll probably be referring to this post in the future. What a beautiful home. It welcomes you from the outside to the inside. Thank you for sharing. What a cozy and inviting space! Nancy has got my kind of colours happening in her lovely home. The curtains and the patterns throughout are so charming! Thanks for the first installment; awaiting the second! Thanks for showing her house again...it's beautiful and timeless. Gorgeous home Stacey!! I love all the mouldings and the traditional decor! The painting is wonderful also! !